Are you getting anxious for summer? We've had quite a bit of rain lately and I haven't been able to get outside to work in the flower beds much. I decided to whip up this painting to feed my need for sunshine and the delights of summer. 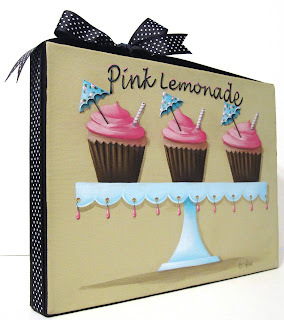 "Pink Lemonade Cupcakes" is up for auction on eBay. Cute cupcakes for a fun summer party! Lemon cupcakes topped with pink lemonade frosting are decorated with striped straws and floral paper umbrellas. This turquoise cake plate with tiny pink jewels dangling from the edge is the perfect way to present these luscious lemon flavored treats. A black and white dotted grosgrain ribbon wraps around the edges of the canvas and is tied in a bow at the top. On our fourth day in Spain we took a train trip to Sagovia. This is the Roman Aqueduct of Segovia. It was absolutely amazing. You can get more information about this from my son's blog. It runs for a few miles and is quite amazing. After reading Eric's post you'll realize that he's much more informative. There is no mortar holding these stones together. and a section of the interior. It was freezing inside. Doesn't this castle look like Disneyland? It was absolutely enchanting....like something out of a fairytale. Oh, and look there's a handsome prince standing outside. I needed oxygen by the time I got to the top of that winding stone staircase and then I took a deep breath and saw this amazing view from the top of the castle! Now here's an interesting tidbit. If you have nasty frizzy curly hair like mine .... do not take your expensive Chi flat iron to another country and use a convertor or you will look like I did in the above picture with the hat for the rest of your entire trip. I burnt my hair, it was literally smoking and ruined my flat iron. When my husband bought my flat iron a few years back is was close to $200. I was not looking forward to replacing it, but I checked on Amazon, ordered the same one for $82.58 (plus free shipping), and received it yesterday. Now I can take off the hat. I don't think it would have looked too good with capris! I've added a link below for anyone interested. It states right in the instruction book not to use with a convertor. Wonderful photos...sorry about your hair and your flat iron. I'd never have known that you were wearing a hat for any other reason than being cold. Your pink lemonade cupcakes are a delight. I've been on a pink lemonade kick since Sunday. Your painting is beautiful as always. I am sorry but I had to chuckle just a little over the flat iron thing. My husband had to rush into a ladies dorm one time to put out a fire caused be someone doing the same thing. Your pics from your trip are amazing. What an experience. Love your pink lemonade cupcakes Catherine and yes, they remind me of summer and happy times. Thanks for sharing some of your gorgeous pictures from Spain...I would love to go some day. Sorry to hear that your iron didn't work... But happy to see that you've loved my country, in fact you've chosen a nice city. Did you go to Madrid? Yes it's been raining here too, I have an Afro, (a blond one) the dampness just does it! I've never used a flat iron. Pink lemonade cupcakes sound like the perfect spring treat! Loved the photos of the cathedral - beautiful views! Cathie, I just love the Pink Lemonade painting! Just gorgeous!! The Spain pictures are wonderful too! Have a great weekend. 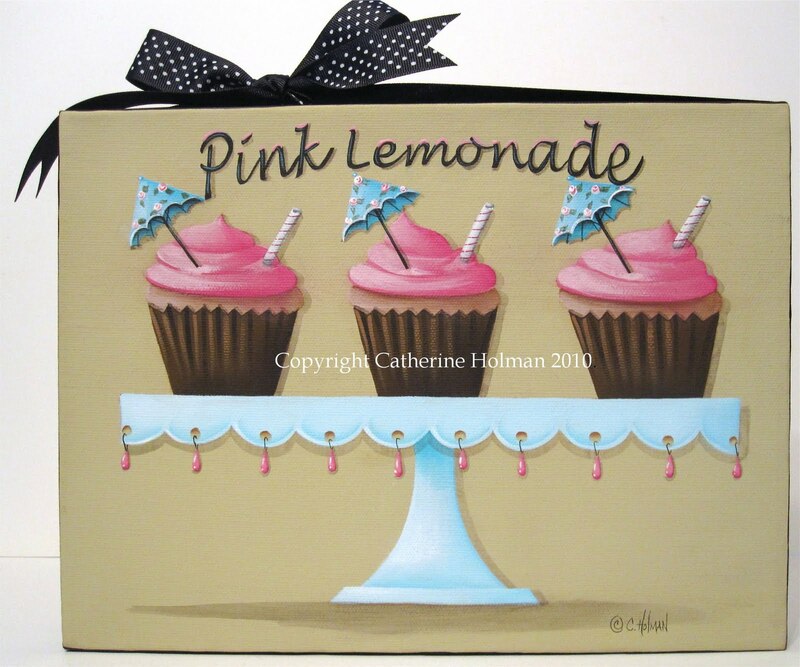 Love the Pink Lemonade Cupcakes painting, Cathie! So cute. Your photos of Spain are amazing, what an incredible place! Hope your hair is ok now! Lovely castle pics. Such beautiful scenery.